For other uses, see Priscus (disambiguation). Priscus of Panium (/ˈprɪskəs/; Greek: Πρίσκος) was a 5th-century Roman diplomat and Greek historian and rhetorician (or sophist). Priscus was born in Panion (located in Thrace) between 410-420 AD. In 448/449 AD, he accompanied Maximinus, the head of the Byzantine embassy representing Emperor Theodosius the Younger (r. 408–450), on a diplomatic mission to the court of Attila the Hun. While there, he met and conversed with a Greek merchant, dressed in "Scythian" (or Hunnic) fashion, who was captured eight years earlier (circa 441–442) when the city of Viminacium (located on the Danube east of modern-day Belgrade) was sacked by the Huns. The trader explained to Priscus that after the sack of Viminacium, he was a slave of Onegesius, a Hunnic nobleman, but obtained his freedom and chose to settle among the Huns. 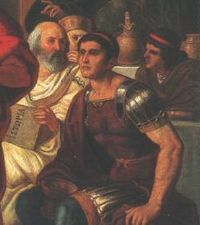 Priscus ultimately engaged in a debate with the Greek defector regarding the qualities of life and justice in both the Byzantine Empire and in barbarian kingdoms. After an interlude in Rome, Priscus traveled to Alexandria and the Thebaid in Egypt. He last appeared in the East, circa 456, attached to the staff of Euphemios as Emperor Marcian's (r. 450–457) magister officiorum. He died after 472 AD. Priscus was the author of an eight-volume historical work, written in Greek, entitled the History of Byzantium (Greek: Ἱστορία Βυζαντιακή), which was probably not the original title name. The History probably covered the period from the accession of Attila the Hun to the accession of Emperor Zeno (r. 474–475), or from 433 up until 474 AD. Priscus's work currently survives in fragments and was very influential in the Byzantine Empire. The History was used in the Excerpta de Legationibus of Emperor Constantine VII Porphyrogenitus (r. 913–959), as well as by authors such as Evagrius Scholasticus, Cassiodorus, Jordanes, and the author of the Souda. Priscus's writing style is straightforward and his work is regarded as a reliable contemporary account of Attila the Hun, his court, and the reception of the Roman ambassadors. He is considered a "classicizing" historian to the extent that his work, though written during the Christian era, is almost completely secular and relies on a style and word-choice that are part of an historiographical tradition dating back to the fifth century BC. Priscus recount of a dinner with Attila the Hun was at, one of the many houses of Attila. But this one was said to be supposedly greater than the rest. Made for celebration due to it being constructed of decorative polished wood, with little thought on making any aspects of the place for defense. Priscus entered the house the following day bearing gifts to Attila's wife. Her name was Kreka who had three sons. The dinner was at three O’clock; Priscus and the embassy of Western Romans were placed at the end of the table farthest from Attila but still in his presence, this was to show a means of Attila being greater than the Roman guest. That to Priscus, Attila considered his people were more important than Prius and the Roman embassy. As Priscus and the Western Roman embassy stood, they followed the cultural tradition of being given tea from the cupbearers. They were to pray and have a drink before having a seat at the table. Attila sat in the middle of the couch, with the seats being arranged linear to the walls. As the seating arrangement went on the right side of Attila was held for the Chiefs in honor. With the everyone else including Priscus and the Roman embassies on the left. Following the seating, everyone was to raise a glass to pledge one another with wine. Once the Cupbearers left another attendant came in with a plate of meat, followed by other items of food such as bread and things of the time. All of the food was served on plates of silver and gold. Prius also notes that Attila didn’t use any silver or gold plates but instead used a cup made of wood, and his attire was very bland. Once the first round was finished, they stood and then drank again to the health of Attila. Once evening arrived torches were lit and songs that were composed of Attila's victories were sung. Priscus is an important character in Slave of the Huns by Geza Gardonyi. He is depicted as a kindly master and scholar, and part of the novel is based on his account of his visit to Attila. Given, John (2014). The Fragmentary History of Priscus. Merchantville, New Jersey: Evolution Publishing. ISBN 1-935228-14-5. Blockley, Roger C. (2009). The Fragmentary Classicising Historians of the Later Roman Empire. II. Cambridge, United Kingdom: Francis Cairns. ISBN 0-905205-51-0. Gordon, Colin Douglas (1966). The Age of Attila: Fifth-century Byzantium and the Barbarians. Ann Arbor, Michigan: University of Michigan Press. Dindorfius, Ludovicus (1870). Historici Graeci Minores (Volume 1). Leipzig, Germany: B. G. Teubneri. ^ a b c d e f g h i j Kazhdan 1991, "Priskos", p. 1721. ^ a b c d e f g Chisholm 1911, p. 361. ^ Toynbee & Myers 1948, p. 14: "The renegade Greek business man from Viminacium whom the Greek historian and Roman diplomatist Priscus encountered in Attila's ordu on the Alföld in A.D. 449 has already come to our notice." ^ a b Christophilopoulou 1986, p. 209: "For information about Attila, his court and the organization of life generally in his realm we have the authentic and reliable evidence of contemporary Greek historian Priscus, who accompanied Maximinus, the head of the Byzantine embassy, in 448." ^ Halsall 1996; Kelly 2004, p. 176; Toynbee & Myers 1948, p. 14. ^ a b Jones 1964, p. 866: "Priscus of Panium met one of these in Attila's camp. He was, he said, a Greek who had settled at Viminacium on the Danube and prospered in trade and married a rich wife. He was wealthy enough to be allotted as a special prize to Onegesius, one of the Hunnic nobles, when the town was captured." ^ a b Halsall 1996. ^ Given 2014, p. xvii. ^ Boston, Ginn; Halsall, Paul (1905). "Medieval Sourcebook: Pricus on Attila the Hun (Readings in European History)". p. 46-49. Retrieved 2 December 2016. ^ Ase Berit, Rolf Strandskogen (2 December 2016). "Lifelines in World History". Routledge. Chisholm, Hugh, ed. (1911). "Priscus" . Encyclopædia Britannica. 22 (11th ed.). Cambridge University Press. p. 361. Christophilopoulou, Aikaterinē (1986). Byzantine History (Volume 1). Amsterdam, The Netherlands: Adolf M. Hakkert. ISBN 90-256-0836-1. Halsall, Paul (March 1996). "Medieval Sourcebook: Priscus at the Court of Attila". New York City, New York: Fordham University. Retrieved 4 December 2011. Jones, Arnold Hugh Martin (1964). The Later Roman Empire, 284-602 (Volume Two). Norman, Oklahoma: University of Oklahoma Press. ISBN 0-8018-3354-X. Kelly, Christopher (2004). Ruling the Later Roman Empire. Cambridge, Massachusetts: Harvard University Press. ISBN 0-674-01564-9. Toynbee, Arnold Joseph; Myers, Edward DeLos (1948). A Study of History (Volume 8). Oxford, United Kingdom: Oxford University Press. Gordon, Colin Douglas (1964). "Fifth Century Chronology of in the Fragments of Priscus". New Review. IV (2–3). Thompson, E. A. (July – October 1945). "Priscus of Panium, Fragment I b". The Classical Quarterly. Cambridge, United Kingdom: Cambridge University Press. 39 (3/4): 92–94. doi:10.1017/s0009838800022643. JSTOR 637017.